Many Semantic Technology companies offer some kind of faceted browsing tool. With TopBraid 3.5 it was time for TopQuadrant to say “me too”, and add some unique capabilities into the mix. The main idea of faceted browsing is to allow users to narrow down a set of objects by selecting properties that the sought-after objects must possess. For example, if you search for people in the infamous Kennedy ontology, you may want to find all instances of Person that went to the same university and share the same profession. 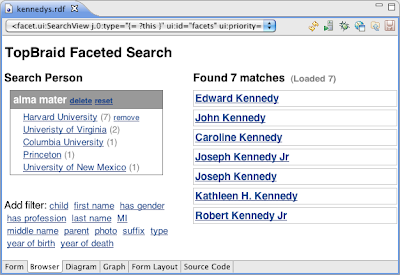 TopBraid’s faceted search component follows a user interface paradigm made popular by FreeBase Parallax: you start with a set of all Persons and the system will compute how many matches are in each category. Clicking on a category will narrow down the set, and you can add the next condition. The following screenshot illustrates this, with the facet “alma mater” narrowed down to “Harvard University”. One distinguishing capability of TopBraid’s Faceted Search support is its customizability. SPARQL Web Pages (SWP) technology can be used to customize the visual appearance of the preview results on the right hand side. A key benefit of SWP is the linkage between ontologies and user interface snippets. Basically, SWP allows you to attach HTML snippets to any RDFS or OWL class in your domain model using the property ui:instanceView, and the system is then able to dynamically select the best suitable visualization for any object that it gets. For example, the visualization for kennedys:Person can be changed as shown below. 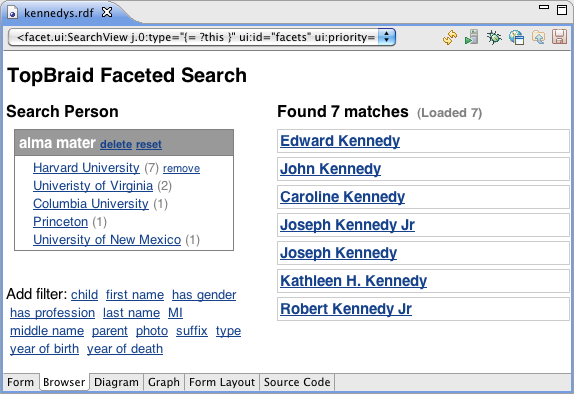 The faceted search component looks for visualizations marked with ui:id=”facetSummary”, and will display them as shown below. Further customizations are possible without any programming: For example you can specify which properties shall be visible by default, and which properties shall not be selectable as facets. There is more to be said about this new capability. But if you just want to get started, use TBC-ME 3.5, select the class that you want to search instances of, switch to the Browser tab and pick the facet.ui:SearchView view in the drop down list. Note that on Windows this currently does not work because Eclipse includes an outdated internal web browser. Please use the button Open current page in external browser. Like with any new feature, we appreciate your feedback.